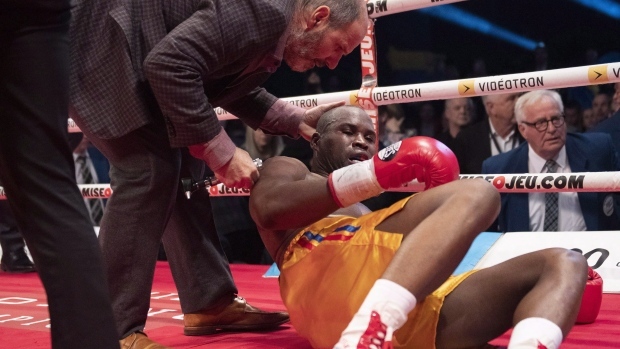 QUEBEC - The medical team treating Montreal boxer Adonis Stevenson in a Quebec City hospital says he remains in stable but critical condition following his Saturday night knockout. Intensive care specialist Dr. Alexis Turgeon told reporters today that Stevenson underwent surgery soon after he was brought to the hospital from the arena by ambulance. The doctor at the Hopital de l'Enfant-Jesus says Stevenson suffered a traumatic brain injury and has been in intensive care since his surgery. Turgeon says it is too soon to offer an opinion on the boxer's short- or long-term prognosis. Stevenson was injured in a knockout loss to Oleksandr Gvozdyk of Ukraine in his WBC light heavyweight title defence.